I keep getting questions about this, so herewith once again the schedule for rabies vaccination. 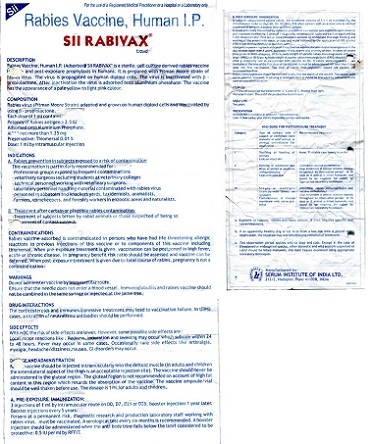 In cases of very severe bites the World Health Organisation recommends in addition to the first anti-rabies injection, a shot of Rabies Immunoglobin. Note that this is a blood derived product and can cause severe allergies. Furthermore, it is expensive and not all hospitals have it in stock. If you have had the pre-bite vaccinations you not need the Rabies Immunoglobin. To keep the validity up to date get a booster shot every year. With that you can follow the after-bite schedule in case you get bitten. Note: there are manufacturers that recommend booster shots only every 3 years. Wash the wound with water and soap for at least 10 minutes under running water. After that apply 70% alcohol or Iodine. These two simple steps reduced the chance that the rabies virus stays potent for upto 90%. Do remember that according to the World Health Organisation India has between 20,000 -22,000 human deaths caused by rabies. This figure is one-third of the world's rabies deaths. However the Indian government disputes this figure and say it is less than a 1,000 annually. According to people working in the field, the figure is much higher than even the World Health Organisation estimates. - that rabies is not a notifiable disease so hospitals are not obliged to inform the government if somebody has died of rabies. - rabies can only be confirmed after death, through a brain autopsy. Apparently in India very few people give permission to conduct such autopsy. on a diseased person. - if they do give permission there are only 4 or 5 laboratories in India which can conduct the test to confirm rabies. - most people that die of rabies are poor people that could not afford to seek medical help. Their deaths are unlikely to be registered as rabies deaths. - probably 80% of people who die of rabies are children. There are two types of rabies: furious rabies and dumb rabies. Furious rabies is a form whereby the animal becomes aggressive and starts biting. It is estimated that 40% of the rabies cases are furious rabies. Do keep in mind that not all dogs that bite have rabies. Severe pain, especially head injuries, can show very similar behaviour. Dumb rabies is a form whereby the animal becomes passive, hides in dark places and whilst it slowly get paralysised. In dumb rabies the animal is rarely aggresive. It is thought that many human rabies deaths are caused by dumb rabies because people did not realise the dog is rabid. Lastly, all mammals can get rabies, including cows. 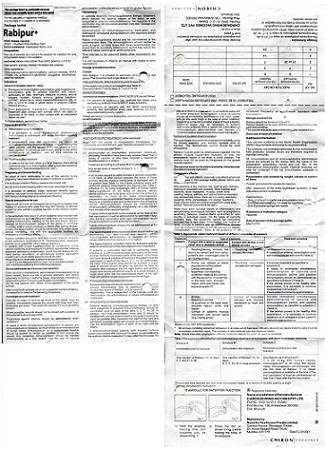 Attached the instructions of two different manufacturers of the anti-rabies vaccinations. The format is small so you will have to enlarge is somehow. I am not a doctor but I would go for a full five-dose post- exposure course if you never had the full pre- exposure. Please note that rabies vaccinations is not get-and-forget: even if up-to-date, you still need the three post-exposure injections after a bite/scratch. I'd also say... it was two nights ago, and you're wasting time asking on the internet? But then I am 100% risk averse when it comes to rabies, and have had two sets of vaccinations for two bites from a known animal, including going to the hospital in the middle of the night. It's over the top, but it is better than death. There is also something that you should have done, the mandatory first aid: wash and scrub the wound (even if only a scratch) with water and disinfectant for a full ten minutes. As you can tell by now, I seriously believe in taking zero risk with rabies. You already know how easy, [almost] painless, and low-cost the injections are: do go to a hospital and take the course.